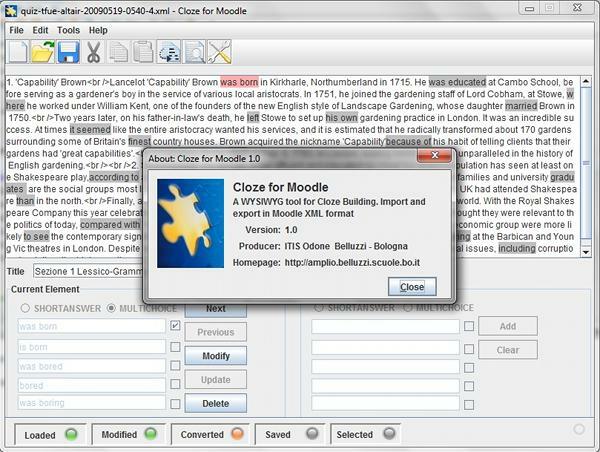 Cloze for Moodle is a visual editor for the generation of clozes in Moodle environment. The program is written in Java and can be executed both as a standalone off-line application and as an applet embedded into Moodle on-line Cloze editor. It’s a "user-friendly" graphic interface that makes cloze creation easy to unskilled users that are usually discouraged by the complex rules of Moodle Cloze editor environment. Cloze for Moodle is an "Open Source" application developed by Michele Fabbri, a Computer Science student at ITIS Odone Belluzzi of Bologna, ITALY, with the support of his teachers Duilio Peroni (Computer Science) and Patrizia Casanova (English). It is a Java application that must be downloaded and installed on the local computer of the Moodle teacher thus allowing him/her to create or modify cloze files in MoodleXML format. MoodleXML files may be imported into Moodle "Question Bank". This solution is addressed to Moodle teachers who may create their cloze files off-line and load them into a standard Moodle platform.